DECOLAV's Stay in the Know! When bathroom space is limited, it's important to maximize its utility while making it feel more spacious. Some simple changes can help you achieve this. Using either a corner lavatory, pedestal with an open shelf below it or wall-mounted vanity like DECOLAV’s Cityscape® Wall Mount Vanity, can conserve foot space and create a more open feel rather than using a traditional vanity. Additionally, wall mounting the faucet allows for the utilization of a narrower sink. 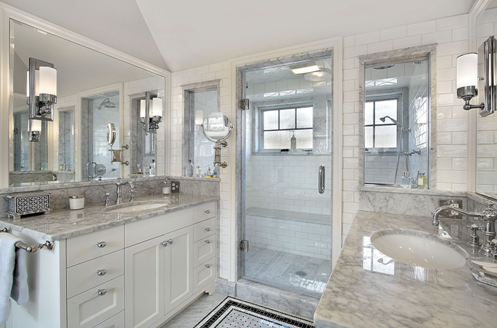 Conversely, if wall space is at a minimum, a towel bar can be added to the shower door. Recessed shelving in the shower, or placed between studs in the wall, allows more storage space without giving up square footage or creating obstacles. If this isn't practical for your bathroom, glass shelving can be a terrific solution. This entry was posted in Bathroom Remodeling Tips, Product Information and tagged remodeling, bathrooms, bathroom furniture, small spaces, decolav, wallmount, vanity, bathroom vanities, bathroom sinks, bathroom countertops, bathroom design, bathroom vanity, bathroom cabinets, bathroom ideas, bathroom cabinet, small bathroom ideas, bathroom designs on May 11, 2016 by DECOLAV. This entry was posted in Press Releases and tagged remodeling, bathroom furniture, company news, awards on March 1, 2016 by DECOLAV.